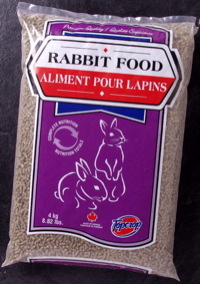 Topcrop Rabbit Food has been formulated as a 100% complete and balanced diet for all adult rabbits. Allow your rabbit access to its food and a supply of fresh, clean drinking water at all times. Further supplementation is not necessary. You may want to occasionally give your rabbit a treat, such as a carrot, seed stick, fresh greens, lettuce or hay. A well planned home for your rabbit will benefit the quality and longevity of its life. Having the proper amount of living area suitable to your breed of rabbit is important for a healthy pet. Your rabbit should have about 1/3 of the cage or hutch allotted for sleeping quarters, with the remaining area for eating and resting. The sleeping area should be warm and dark with a soft, dry material for bedding, such as straw. If your rabbit is outside, it needs to be sheltered from the effects of the weather. In their natural habitat rabbits like to burrow and stay cool, so the environment you provide should imitate this as closely as possible. Grass clippings and other leafy materials not intended for human consumption may contain pesticides and should not be fed to your rabbit as they may have a detrimental effect on its health. Corn and/or Barley, and/or Oat Hulls and/or Wheat by-products, and/or Canola Meal, and/or Soybean Meal, Molasses, Dehydrated Alfalfa, Calcium Lignisol Sulphate (a binding agent), Salt, Calcium carbonate, DL-Methionine, Vitamin A, Calcium iodate, Vitamin D3, Manganous oxide, Vitamin E, Sodium selenite, Pantothenic acid, Copper Sulphate, Folic acid, Zinc oxide, Niacin, Ferrous sulfate, Thiamine mononitrate, Pyridoxine hydrochloride, Vitamin B12, Biotin, Riboflavin, Menadione.